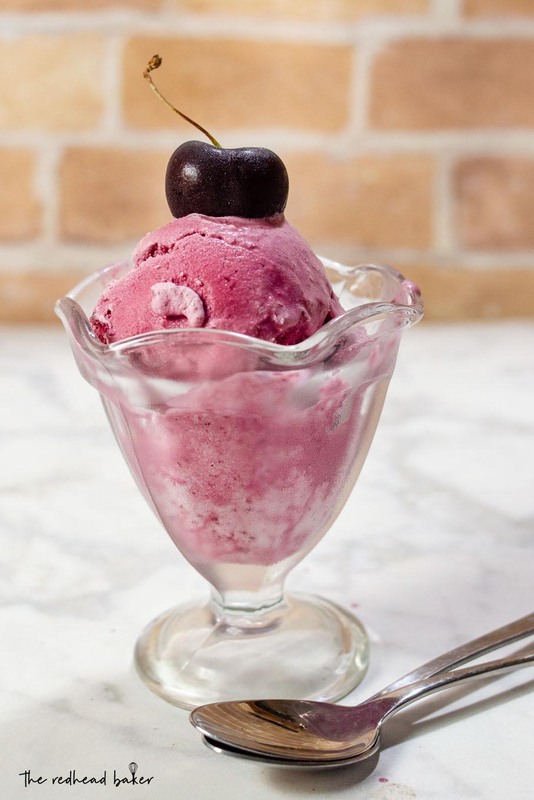 Bourbon roasted cherry ice cream may be time-consuming to make, but the intense cherry flavor with hints of bourbon and almond is worth the wait! Today concludes Farmers Market Week, and I’m finishing up the celebration with ice cream. 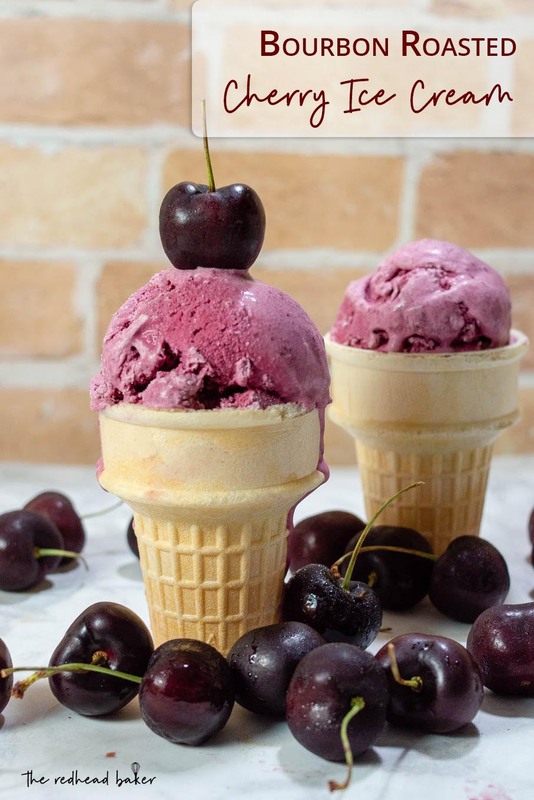 After all, it is summer time, and one of the most popular summer fruits is cherries. 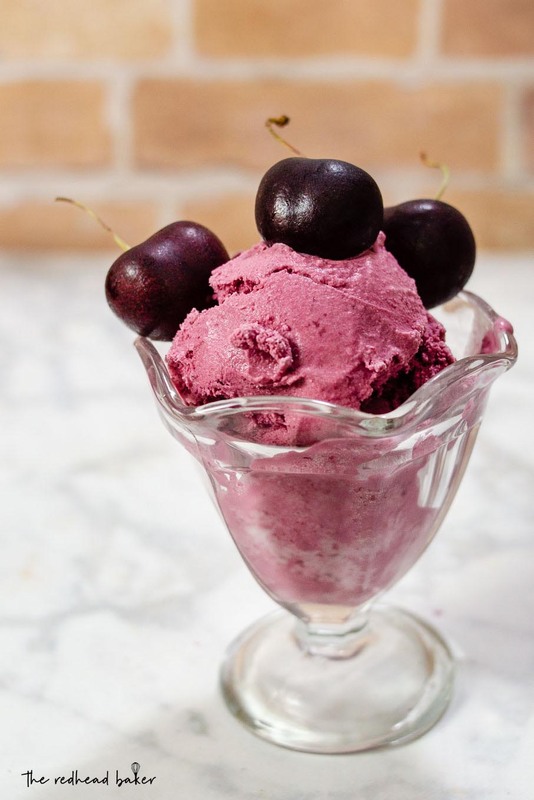 Everybody knows how well cherries and almonds go together, but cherries and bourbon are also great complementary flavors. I took a few pounds of whole, unpitted sweet cherries and roasted them in bourbon and brown sugar. Roasting the cherries “bone-in” gives the ice cream an even more intense cherry flavor, because even though we don’t eat the pits of cherries (unless you prefer broken teeth), they do have flavor. Even after roasting, even more flavor is extracted from the pits by steeping them in the cream. This steeping infuses the cream with the flavors of cherry and a slight hint of almond. The bourbon and cherry juices are cooked down and concentrated, then mixed with the infused cream. Then your base is done! 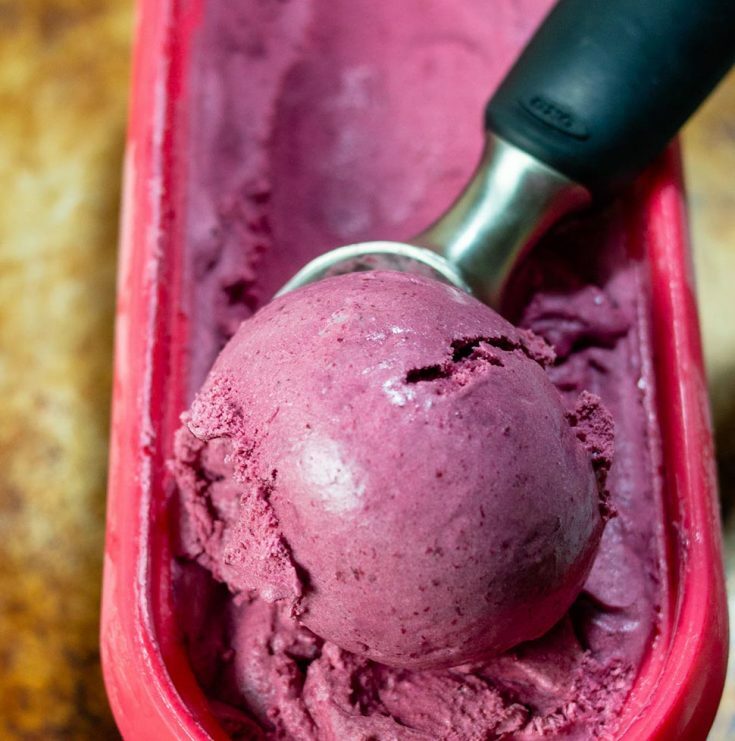 This ice cream is “Philadelphia-style,” meaning it contains no eggs, letting the cherry flavor shine even brighter. I love, love, love the flavor of this ice cream. The color is beautiful, too. And with no eggs, there’s no custard to stress about cooking. It is delicious on its own, or with a light sprinkle of shaved chocolate. This recipe can be made with sour cherries, too, if you prefer. Obviously, the flavor will be a little different, and the color will be redder rather than this purple-ish red, but still delicious. Place the cherries in a shallow glass casserole pan. Sprinkle with sugar and bourbon. Roast for about 40 minutes. Remove to a cooling rack until the cherries are cool enough to handle. Set a mixing bowl and a small saucepan beside the casserole pan. Working over the casserole pan, gently squeeze the pits out of the cherries. Place the fruit into the mixing bowl and the pits into the saucepan. Pour the cream over the pits in the saucepan. Set over medium-low heat and bring the mixture just to scalding. Remove from the heat and allow to cool to room temperature. Roughly chop the cherries or quickly buzz them with an immersion blender to break up the large chunks of fruit (do not puree). Combine the chopped fruit with the reserved juices (in a saucepan, if your roasting pan is not suitable for use on the stovetop). Cook the fruit and juices another 5 to minutes, until thick and jammy-looking, but not dry. Strain the mixture through a fine-mesh sieve. You should have 20 ounces of liquid. If you have more, continue cooking until further reduced. If you have less, add enough water to make 20 ounces. Discard the cherry pulp in the sieve, or reserve for another use. Strain the pits out of the cream and discard. Whisk together the reduced juices and the cream. Transfer to the refrigerator to chill for at least 24 hours. Taste the mixture and add kosher salt and/or lemon juice until you are satisfied with the flavor. Churn in your ice cream maker according to the manufacturer's directions, then transfer the churned ice cream to a freezer-safe container and freeze at least 8 hours. 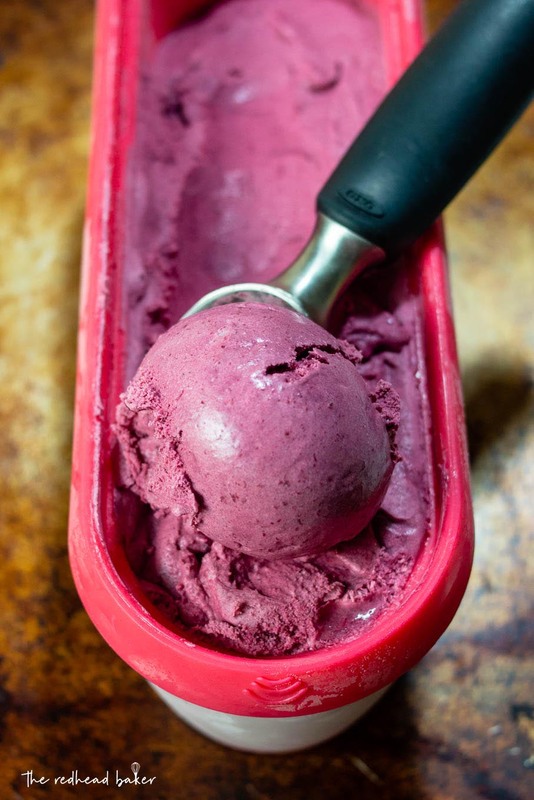 Oh my goodness, what a crazy good sounding ice cream flavor and the color is beautiful as well!